Kalimpong: The rebel faction of the Gorkha Janmukti Morcha said on Thursday that it was helming the GTA with the knowledge that it was a body that would have to work by taking the state government into confidence, but not at the altar of Gorkhaland. 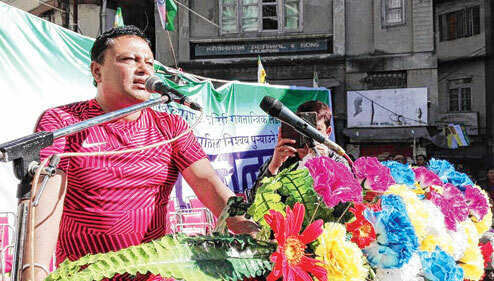 Addressing the first public meeting organised by the anti-Bimal Gurung faction of the Morcha in Kalimpong, Anit Thapa, the second-in-command of the Binay Tamang group, said the GTA was a set-up that, by its constitution, would have to work in tandem with the state government and they were not going to lie about it. "We will not indulge in politics of lie. Gorkhaland is our ideology and we will not go astray. We know the reasons why we are doing what we are doing," he said. Thapa said Bimal Gurung had settled for the GTA knowing fully well that it was a body within the state of Bengal, but lied about it to the people. "They moved around in beacon lights and told the people this was Gorkhaland. We are not going down that route," he said. Thapa was essentially trying to drive home the point that his group had not compromised the cause of Gorkhaland by playing ball with the state government. "The Tamang faction has been accused of hurting the Gorkhaland cause by settling on what is derisively called GTA II for their own interest. Thapa is essentially trying to allay those fears, but his group still have a lot to do before they can rid themselves of the perception that they are essentially doing the bidding of the state," said a political analyst. The rebel faction of the Gorkha Janmukti Morcha said on Thursday that it was helming the GTA with the knowledge that it was a body that would have to work by taking the state government into confidence, but not at the altar of Gorkhaland.